The video below found its way into my inbox this morning and I wanted to share it. For those who aren’t aware of the I Am Second movement, it is a fabulous one! They talk about becoming “an agent of change” wherever you are. Our society is one that demands winning and expects perfection. It is easy to be solely consumed with becoming first in everything we do. The best athlete, student, mother, employee, you fill in the blank. 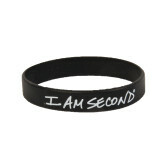 The I Am Second movement is meant to inspire people of all kinds to live for God and for others. We become second, and experience the freedom that it brings with it, when we lay all of this other stuff down and put Jesus First. Seconds are bold to lift up Jesus and tell others. I love that word, BOLD. For me, bold is stepping out of my comfort zone and into the danger zone. Bold, does not come naturally to me but in the moments that I find myself needing a little boldness I know that I can draw on the strength of Christ to supply it, relying on Him and not myself. May you be bold. May you be encouraging. May you become Second. Everybody has a “cause” these days. Make yours one that will reap eternal rewards. If you do choose to become an agent of change in this movement, watch who God funnels into your life and be prepared to answer their question, what does “I am second” mean? Many, many times as I wear my simple black band, I have been asked. But, I have also found that it serves as a very simple personal reminder that this race is not all about me. run a race. start a conversation. finish second. We have to start at the beginning. So, if this is to be an anatomy of a good run we have to answer the question what makes a good run. There are a couple of things that are absolutely essential for me. First are my trusty Nike Vomeros. I haven’t found another pair of shoes that make my feet happier and as long as my feet are happy I can go on and on and on. Second is my music. This is essential for putting me in the right frame of mind. Most days I have a stream of worship songs blasting directly into my ears, blocking out anything else. Finally, a place to run is needed and this is where the beauty comes in. I have run many miles both on the treadmill and outside. This spring, I couldn’t wait until the weather broke so that I could feel the warmth of the sun on my face while I was running. I also particularly remember one spectacular day last fall when the trees were ablaze with their fall colors and I couldn’t help but marvel at God’s creation. One of my favorite outdoor places to run is at a nearby resevoir. I am a sucker for water and it’s peaceful tranquility. I will also let you in on another secret about this place. There is a bakery nearby and sometimes early in the morning if the wind is blowing just right I can smell the bread baking. I don’t think there is anything that smells better than fresh baked bread. Talk about engaging all of my senses! 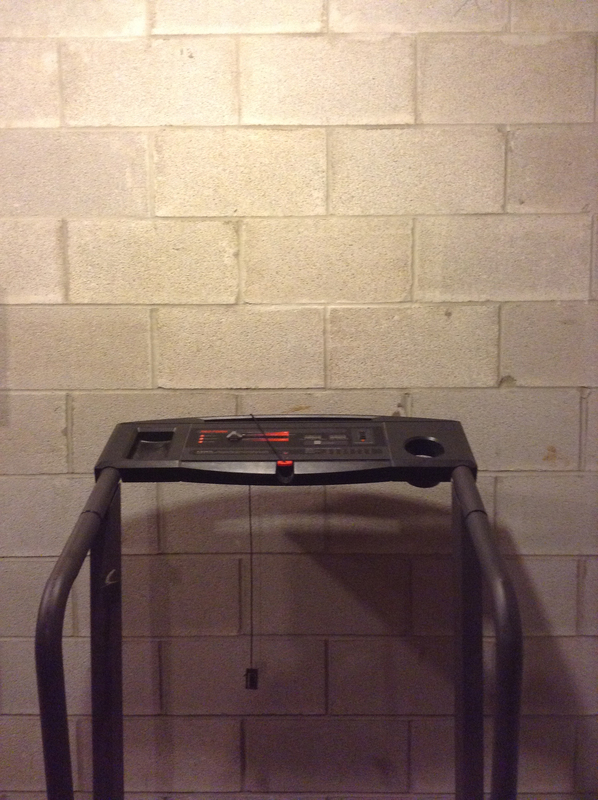 Those are all great places to see God but, if I really need to hear from God I hit the basement treadmill and stare directly into my cinder-block wall. That is where the magic happens for me almost every single time. This is where I come when I really need to be drawn in, when I am searching for the stillness, when I am looking for not just a run, but a good run. James 4:8 says “Draw near to God, and He will draw near to you.” It doesn’t always happen as soon as I take the first steps. Sometimes it is a fight to turn my mind form all of the things that need to be done, all of the things screaming for my attention. But I have found that as I keep pounding away, I am leaving behind all of the worries and to-dos and drawing near to God. There is a passage in 1 Kings 19 where the Lord appears to Elijah and what I find I can relate in these verses is where God finally shows up. “Go out and stand before me on the mountain,” the Lord told him. And as Elijah stood there, the Lord passed by, and a mighty windstorm hit the mountain. It was such a terrible blast that the rocks were torn loose, but the Lord was not in the wind. After the wind there was a terrible earthquake, but the Lord was not in the earthquake. After the earthquake there was a fire, but the Lord was not in the fire. And after the fire there was the sound of a gentle whisper.” (1 Kings 19:11-12) There in that gentle whisper is where Elijah finally found the Lord. We find our senses absolutely bombarded everyday with chaos and noise, incessant chatter. Finding the quiet, your quiet, where you can hear the whisper of God is essential if you want to draw near to him. For me, being surrounded by His “wind, earthquakes, and fire” are a wonderful place to worship Him but that’s not where we are able to commune. I am also not going to claim that every time I run it’s a beautiful, awe-inspiring, hands raised in worship kind of experience. There are days when it physically hurts, days when my mind refuses to shut down no matter how I try, days when I feel more frustrated having tried and failed. But, on the days when I can cut through all of the junk, and quiet my spirit, there is nothing like it! Being still doesn’t always mean ceasing movement. I would encourage you to find your “cinder-block wall” and see how beautiful God can make it. Congratulations! You have a blog. Now What? That is what I have been asking myself the last couple of days. Waiting for divine inspiration to strike, some profound insight to share and I’ve been coming up empty. But this morning as I was cleaning the kitchen I finally came up with the “next post.” (Running isn’t the only place to find the stillness and hear from God, it’s just my preferred place. To me it is a lot more enjoyable than cleaning!) I realized a couple of things. I can’t force this. Otherwise it isn’t going to be authentic and genuine which are two things that I strive to be above all. If I start forcing things, it becomes more about me and less about God. As I was wiping the counters down I was reflecting on the week. What a week of ups and downs, some arguing with God, some pleading with God, and some rejoicing in God’s goodness. Here is my question for the day. Have you ever argued with God? And as a follow-up, how did that work out for you? Recently, I was railing against God. I was being asked to be the “hands and feet” in a very real sense to someone who I really didn’t feel like loving. I was throwing up all kinds of excuses and arguments trying to get out of the task that laid before me. “God, you don’t understand. I have been hurt. God, I have tried to share your love with them, your Word. It continues to get thrown back in my face. I fall flat everytime.” I wanted to quit trying, quit opening up the door for hurt. The problem was I knew what the right thing to do was but I just kept protesting to God. This one-sided argument had been going on for awhile as I was grumbling around and then as if the thoughts rattling around in my very human brain were the Red Sea, they parted and I had this one single thought. God wins again. I realized that if there was anyone who understood turning the other cheek, loving in spite of, and never giving up on someone no matter how many times they turn away it was God. He does understand and was calling me to be more like Him and love them the way He has loved me, offer them the same mercy and grace and forgiveness He has offered me. He was providing me an opportunity to show through actions the person I claimed to be through words and I was complaining about it. I have to admit, this lesson stung a little bit. No, let me correct that. This one stung quite a bit. Swallowing my pride and admitting to God that I was wrong is incredibly difficult. So there you have it. Honesty offered to complete strangers. Maybe you can learn from my lessons and avoid the sting of pride and self-righteous anger towards others. Forgiveness is hard, especially when the person you are offering forgiveness to really has hurt you but it’s what we are called to do. How many times? Seventy times seven, as many times as it takes. Walking away is the easy way out. Ambivalence doesn’t hurt the way forgiveness can. What if that was the way Jesus left things though? Who will reach out in the name of Jesus to those who don’t know His love, His mercy, His salvation? It will only come through the love of God that we can love the unlovable in our lives. But if we take the first step He will provide the way. We are called to be different. So, if not you, who? I believe we will all face at least one moment in our lives when we find ourselves face to face with something that forever alters the course of our lives. There is the “before” us and the “after” us. Sometimes these are huge, sometimes they are just a minor adjustment. Sometimes they are joyous and sometimes they tear us down to our very core. On January 26th 2012, my life was forever changed, for a second time. (Read My Story to learn more.) The ways have become numerous but one of the most surprising to me has been in my discovery of my love of running, which started as an effort to combat the side effects of the medication that is supposed to be making me well. (Weight gain is one of the most obvious side effects of prednisone but did you also know that it will turn the muscle in your hips, upper arms, and base of your neck into fat? The doctor continues expounding on the lesser know side effects the more we “visit.”) In light of this, on March 3rd 2012 I have my first documented “run” which was more like a walk, 2.84 miles in 54 minutes. I have come a long way in the last 15 months, 648.3 miles to be exact. I could have run from Indianapolis to Philadelphia! My farthest run was 11 miles in 1 hour and 46 min, my fastest mile, 6 min 38 sec. In all, 184 runs. So, why am I sharing this? First of all, anyone who knew me at all “before” knew that I HATED running. I can’t stress that enough. There was NOTHING about it that I liked even a little bit. So what changed? Where has this new insanity come from? My running partner…God. My running has become a time of worship for me, a time of prayerful crying out to God, a time of reflection, learning, and most importantly a quiet time of listening for God’s still small voice. Quite simply put, the faster my feet, the quieter my mind becomes. When I run, I become still. We can’t escape from pain in this world; whether that’s going through hard seasons personally or watching our loved ones do the same. Here’s what I love though…even in my darkest and most disturbing moments, as real and as painful as they might be, I stand on an even greater reality. It’s the truth of God who never lets go and never loses control. The One who never changes. The One who is always good and merciful, always strong and mighty to save. The One who renews my strength and guides me along right paths. Standing on the unshakeable truth of our God, I can make it through the storms of life. Will you join me in this journey to stillness in Christ no matter how the storms may rage around us?